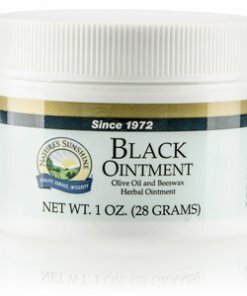 Nature’s Sunshine Black Ointment is a topical ointment designed to help soothe irritated skin. Mixed with Nature Sunshine’s Bone/Skin Poultice (BON-C), Nature’s Sunshine Black Ointment makes a soothing compress that may help injured or infected skin. 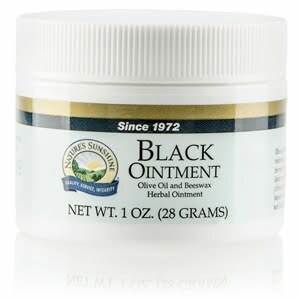 Black Ointment contains extracts of chaparral herb, lobelia herb, comfrey leaf, golden seal root, plantain root, red clover herb, mullein herb, marshmallow root, chickweed herb and myrrh gum in a base of olive oil, beeswax, pine tar and vitamin E oil. Instructions: Apply liberally as often as needed. Store in a cool, dry place. Do not refrigerate. Olive oil, chaparral herb, lobelia herb, comfrey leaf, golden seal root, plantain root, red clover herb, mullein herb, marshmallow root, chickweed herb, myrrh gum, beeswax, pine tar, and vitamin E oil.